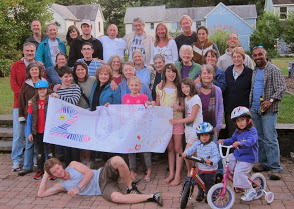 Pathways Co-Housing community, located on a 40-acre wooded site, is a short bike ride away from Northampton, MA. It is a place where members' lives are enriched through the regular sharing of time, celebrations, meals and designated facilities. Semi-private back yards have easy access to walking trails and to Rocky Hill Cohousing, a 5-minute walk through the woods. Solar panels are sprinkled on some of the roofs and all homes carry the ENERGY STAR label. Our common house offers a place to gather for dining, sharing common interests, ping pong and game night, dancing and parties, and community meetings. The two guestrooms are often used by extended family and visitors. Kindness, simplicity, and respect for the values and needs of others are our guidelines. We seek to create and maintain a nurturing environment for children that fosters independence and respect for others. We wholeheartedly embrace the diversity of our immediate community and extended community; we endeavor to include and fully support a diverse range of cultures, religions, ages, genders, sexual preferences, classes, and family constellations. We maintain our land and facilities in an environmentally sound fashion, have a community garden, and use consensus as the primary mode of decision-making.